Can Electrostimulation Reverse Memory Loss? In this episode, Dr. Hackie Reitman talks with Marcie Ciampi M.Ed., otherwise known as Samantha Craft – autism self-advocate, author, and educator. 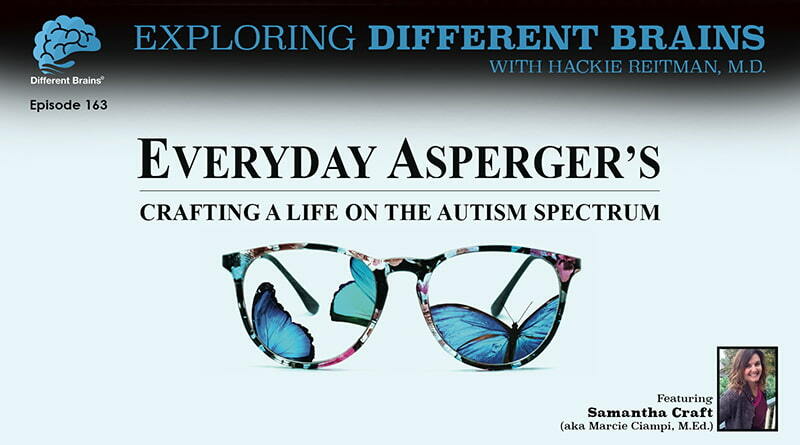 (25 minutes) Under the pen name “Samantha Craft”, Marcie is the author of the book Everyday Aspergers: A Journey on the Autism Spectrum, as well as a contributing author to the book Spectrum Women: Walking to the Beat of Autism. She is also a vocational coach, a peer mentor, business consultant, and community manager/lead job recruiter at ULTRA Testing. 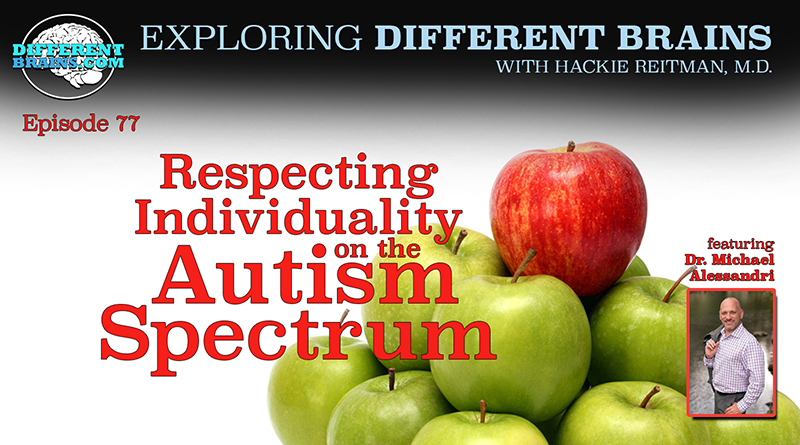 Join Hackie and Marcie as they discuss her writing, her experiences as a woman with ASD, and her endeavors to assist individuals with autism find meaningful employment and other resources to help them maximize their potential. To listen or download the podcast version of this episode, see the embedded player below. HACKIE REITMAN, M.D. (HR): Hi, I’m Dr. Hackie Reitman, welcome to another episode of Exploring Different Brains, and today we’re very fortunate to have with us, Marcie Ciampi, whose the head of all Ultra testing, whose a poet, an artist and does so many different things were going to hear all about. Marcie, welcome! MARCIE CIAMPI, M.Ed. (MC): Thank you, thank you so much for having me here today as I mentioned earlier, I feel like I already know you from our interactions on social media and through your website and thank you for all you do, I share your articles and interviews frequently at Ultra testing and they’re just a wealth of information, so I really appreciate your efforts in your organization. HR: Well thank you very much. We’re going to learn and teach our audience all the great stuff you’re doing, but first, we’ll start with just some background. Tell us about yourself. MC: My name is Marcie Ciampi and my author’s name or pen name is Samantha Craft. More people know me by Samantha Craft. I started a blog over 6 years ago shortly after I was diagnosed with Asperger’s Syndrome. At that time there wasn’t a lot of information that I could readily find online about females with Asperger’s. There were few- a couple authors that were wonderful that I looked into their two books but other than that, is very much lacking and I was processing what it was like to be an adult on the Spectrum, diagnosed later in years, it launched after I was pursuing a second master’s degree in counseling and the head of the department of the college I went up to him and told him that more than likely, I was on the Spectrum, I was seeking diagnosis and for about 5 minutes he continued- he started to belittle me and question me and make assumptions about me that I was saying that I was- had Asperger’s based on my son having Asperger’s, that I was inventing by diagnosis so I can feel closer to him. That I was announcing to the world that I had a broken brain, was I going to the medicate him and damage him essentially. So the reaction I got from the professor really shocked me and had a dramatic effect on my life, and what I did is I channeled that negativity in that herd into something more productive, and more beautiful in the world, and I started writing about my experience as a woman on the spectrum. Later on, after more than a thousand pages of that blog and writing every day for more than a year and a total of four years I believe many people started asking if I would turn the blog into a book and so it’s now and it 2nd edition. Picked up by a publisher in the UK called ‘your stories matter’, he focuses on stories written by actual people who are neurodivergent, so I’m very proud to be apart of that establishment; in addition I have three sons who live in the state of Washington, and my middle son who’s now just turned 20, Andrew, is on the autism spectrum diagnosed with Asperger’s at age 4, and he is doing very well in his first year at college this year, so we’re excited about that. I used to be a schoolteacher with a Masters in Education, taught for several years, and as you mentioned I also like to paint and write poetry; I have three blocks in total. I have another blog called “Everyday Aspie” and I’m also the senior recruiter and inclusion and diversity specialist at Ultra testing which is a company with a neurodiverse hiring initiative and I can talk to you more about that in a while. HR: Based on this terrific background you have, and the fact that your brain is obviously a high-octane- you’re a lot smarter than me, so I want to ask you, where do you think the research Community, the autism research Community, might be going wrong at this time, that might be redirected, if you have an opinion on that. MC: Nothing new there! They could have just asked a room full of Autistics. MC: You know, there’s research, why don’t you just go to the source and ask the autistic adults, and find out more about what’s going on with us, and you know, the non- the ones that don’t speak in traditional manners, as well, you know, you can ask them through communication devices; ask us, ask the children. I think also where they have it wrong, is they undermine and underscore accomplishments, and where we are successful on my website, my personal website, called “Spectrum sweet Suite” is in an office suite myspectrumsuite.com; I spent a long time listing all different autistics around the world and- autistics that are in doing different things: artists, speakers, authors, advocates, so that when I meet with parents, or other autistic individuals, I could say “you know we’re not- we are having successes, some of us of course aren’t, and that’s not to undermine or underscore the people that do have huge challenges, and having a hard time with certain types of success in life; but there are autistics that are, and so I would say to focus “if the media could focus more on that”, too often if you’re watching a newscast in the last several years, you’ll see a superior standing above this inferior white Caucasian Tech person sitting at his computer saying, “well, we learned just to be frank towards them. We learn, you know, just just to say it as it is. We’re tailoring so they understand us”, and and it’s so demeaning, and it’s so stereotypical, and you know why aren’t they both standing at an equal level, and why isn’t the autistic person the one that’s manager standing up, and the non-autistic one the one on the computer, and why isn’t that autistic manager saying, “yeah, we’re working to teach them how our brain works, so that we can have- we can have the environment that’s more inclusive and we understand our differences, and we understand diversity and we celebrate that, so much of it is about singling out what’s wrong, and fixing, and -and how to make us better when a lot of us already think we’re just fine the way we are. HR: Now, regarding females, have you run into Tania Marshall in Australia? MC: Yes I have. She actually featured me in one of her earlier books. MC: Yes, I’m featured in there, she also reviewed my book “Every Asperger’s” for me, and we’ve had associations- not not so much recently, but we’ve had associations in conversations online through social media. So yes, I’m aware of her work. I’m aware of some of the several different advocates in speakers works, and I tried to keep very updated on what’s going on in the autism community in the culture. HR: I don’t know what the real numbers are, what’s your best guess as to any ratios? MC: You know, I’m starting to see the numbers are increasing, from up to between 1-2% into more closer to 3%, and I would venture to say of the population, that I’d venture to say that autistics as a whole is going to continue to rise, as more people that have self-diagnosed come out more, people are correctly diagnosed that have been incorrectly diagnosed, so often particularly females, and as far as the ratio between males and females, personally I think it’s more of a one-to-one, that we present in a different way, than males on the Spectrum so that we’re often split through, so we’re not identified usually at all, and if so, not till a ladder age. HR: Yeah, and it doesn’t help the fact that most of the stuff is written by men, or has been historically up to this point. MC: I’ve talked about that! Not only is it written by men, but it’s also written by people who are not autistic. It’s discriminatory, it’s discrimination, it’s dividing us more and more, and so what’s happening is there’s becoming all these divisions within our actual neurodiversity movement which you know, hopefully that’s growing pains; hopefully that’s just what happens with any type of advocacy movement, but it it’s difficult to watch- what’s happening is there’s parents and those individuals who are saying you know, “by saying, by focusing on all of our successes, and how capable we are, and and being so outspoken, we’re not giving due justice to the children that are harming themselves, and harming other people and cannot communicate in any manner, and cannot function independently at all, that they need that help, they need that assistance.” So that’s one of the challenges that we’re facing today that I am I’m watching unfold. I’m hoping that- I tried to promote kindness and respect and debate in a very logical, rational – remove your emotions from it – no name-calling way, where you’re talking about the issues, not about people. But too often what’s happening within these groups is they’re starting to name-calling, talking about people and not the issues themselves. HR: What is one piece of advice you’d have for someone who just got diagnosed with Autism as an adult? MC: That’s interesting, I was meeting with a father who has a son that’s on the Spectrum yesterday, to see how I might support them, and I also, at the 11 autism conference in San Diego last year I taught a breakout session on empowerment for those on the spectrum. So I had a lot of think time for this question. So let me see if I can reformulate, I often do much better on paper than I do speaking aloud; I can get vast amounts out on paper and then when I try to formulate it aloud, because of my dyslexia and dyspraxia and working memory issues, and what I teach about is first of all, finding out what autism means to you as an individual. What is Aspergers, what is Autism, what -how are you going to identify in this world? So what would that mean? That would mean looking for tools, going to books written by actual autistics, blogs written by autistics, YouTube, your type of media that you put out there into the world that helps going to those resources and really understanding what autism is about. When I was explaining it to the gentleman yesterday, I was explaining that for me, and I hope this isn’t offensive, but the way I like to look at it is if someone adopted an individual from a different culture, let’s say a black child. You would still want to immerse them if you were Caucasian, you still want to immerse them in their history and their Heroes, and in their culture, and what is happening with neurotypical or non-autistic parents that have autistic children, is I think sometimes you’re missing the aspect that autism is not only a diagnosis, but it’s also an identity in a culture, so it’s so important to understand that culture, and where do you come, and what the history is and who your people are. HR: Marcie, tell us some of the factors that played into you winning the community Achievement Award in 2017 at the ANCA World Autism Festival. MC: That is a festival that is held in Vancouver, Canada, and Leonora’s one of the founders, and I had attended the conference in 2016, and was hugely inspired by it, it was gathering from people all over the world, and what I really appreciated about the place, is the younger -the children and the young adults on the Spectrum. There were some who didn’t speak in a traditional way, and they were allowed to stem and just walk back and forth, and make noises, and feed themselves, and there- it was nothing about “how do we fix this”, it was all about “how do we celebrate autistics, and our skills, and talents, and accomplishments.” and so how it came about is I was recognized for my accomplishment of community outreach. I’ve had correspondences voluntarily and paid with probably over 10,000 people on the Spectrum through social media and through conferences and such. Emails, and that was one of the reasons I was recognized, and also from my work at Ultra testing, creating a neurodiverse hiring process that really reflects best hiring practices, and best practices for those on the Spectrum, and I was recognized for my contribution of the book “Everyday Asperger’s”, which is my journey from childhood to current times of what it’s like to look through the eyes of the female on the Spectrum. So it was a kind of a combination of my history over the last several years of what I’d been doing and where I put my time and effort , and I was very humbled and delighted at the same time; because it’s one of the most beautiful experiences I had going to that conference, because of the genuine -genuine respect and love that was given to everyone there, despite their – how they might seem or appear different. HR: Very very nice, and you’re very deserving of any award they can give you. How does our audience learn more about you? HR: Give us your definition from your unique perspective of neurodiversity. MC: For me, neurodiversity is the ways that some individuals’ brains differ. From the typical brain, which doesn’t mean that it’s less than or greater than, it just means that it’s sometimes presents as different, and it’s a different way of seeing and perceiving and processing the world and that neurodiversity isn’t something that needs to be seen as a disability, or isn’t something that’s a disability- it’s just a way of being in this world, and that the more we can recognize people’s differences, and accept them and value them, the better place it will be for everyone, and then neurodiversity umbrella, it’s growing; it includes those on the Spectrum, those that have ADHD mood disorders like PTSD, generalized anxiety disorder, dyslexia, dysgraphia, Dyspraxia, and it’s also growing to include even people who had brain injuries; so I mean feasibly it can continue to grow until everyone’s neurodiverse. HR: Well that’s- that is very well said, that is very well said. Thank you for that. Marcie, a curiosity question, how did you choose your pen name of Samantha Craft? MC: This spiritual connection, it was I already knew I’d already seen the place in my mind’s eye, and we had almost a mother daughter relationship for several years and then at age 50 she passed away of a brain tumor. MC: And so there’s a story of her in there in my book, and so it’s in memory of someone who would had a great faith in God, was a gentle spirit, loving, open, intelligent, and who served as a nurturing mother figure for me when I was in a town without – you know, without that. So… yeah. HR: What a beautiful story. MC: I mean it really does encompass my personality -giggly 1-minute, crying the next! HR: (chuckles) Marcie Ciampi, who writes under the nom de plume of Samantha Craft, it’s been such a pleasure having you today on Exploring Different Brains, thank you so much for being with us! MC: I really enjoyed the opportunity, and your presence, and felt very comfortable speaking with you, and thank you again for everything you’re doing contribute to the neurodiverse community. (24 mins) In the second of a two part interview, Hackie Reitman, M.D.continues his conversation with Dr. Michael Alessandri, Exec. Director of the University of Miami-Nova Southeastern University Center for Autism and Related Disabilities, and chair of the Autism Innovations & Global Impact Conference hosted by Els for Autism. In this episode, a student with autism becomes homecoming king, “Aspergers Are Us” takes the world by storm in their new documentary, and Michael J. 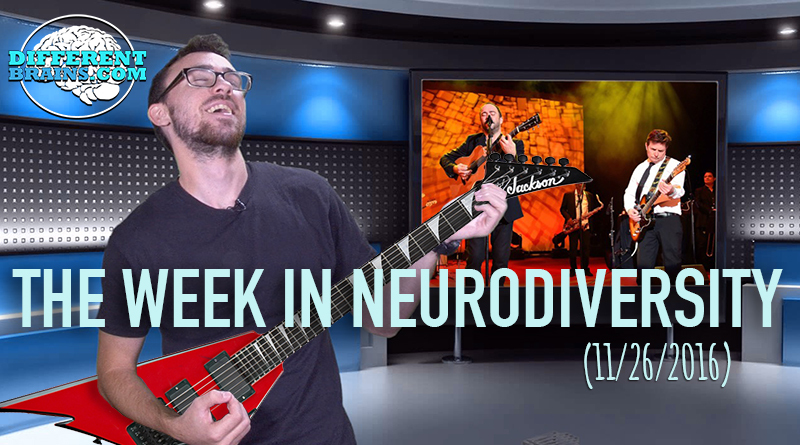 Fox jams with Dave Matthews for a Parkinson’s Benefit! 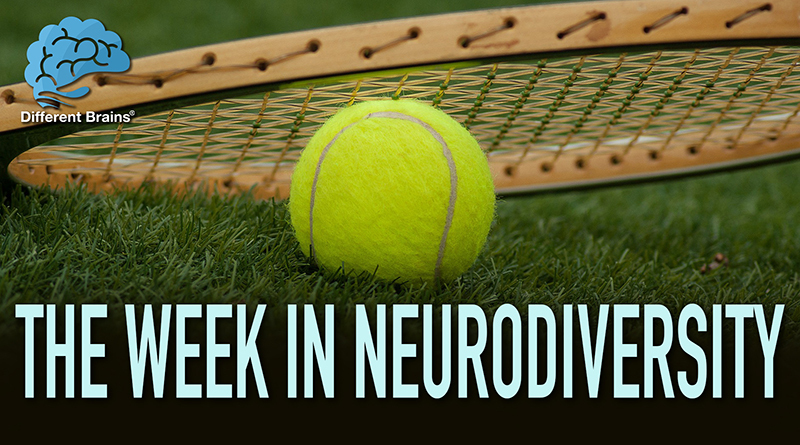 (3min 50sec) In this episode: people with Down syndrome are empowered through the game of tennis, a community comes together for a teacher with Parkinson’s, a runner with autism looks to add some mileage in 2019, and more! Different Brains ® is a 501C3 nonprofit organization dedicated to promoting the understanding and acceptance of the basic variations in the human brain known as neurodiversity; ending the stigma attached to the related diagnoses and treatment; uniting silos of resources and research whose goals could be better achieved through collaboration; offering support to families and caregivers; and improving the lives and maximizing the potential of those whose brains may be different. Copyright © 2019 DIFFERENT BRAINS. All Rights reserved.